Background: Aphasia is a common complication after stroke, and traditional speech and language therapy (SLT) has a limited effect on post-stroke aphasia (PSA). While there has been an increasing number of controlled clinical trials on the efficacy of drugs in the treatment of PSA, there have been very few systematic reviews on the efficacy and safety of pharmacological treatments in people with PSA. Objective: To evaluate the efficacy and safety of pharmacological interventions for PSA. Methods: The Cochrane Central Register of Controlled Trials (CENTRA), PubMed, Embase, Chinese Journal Full-text Database (CJFD), China Biology Medicine disc (CBMdisc), Wanfang Data and VIP Information System were searched for randomized controlled trials about pharmacological treatments for PSA. 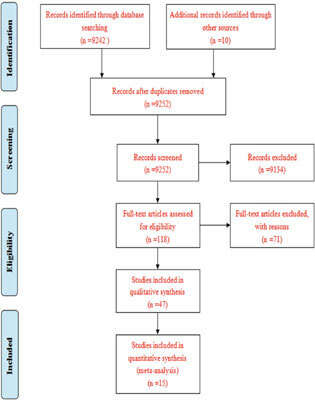 Literature screening using the inclusion and exclusion criteria, data extraction and methodological quality assessment of the included studies were completed by two independent reviewers. Methodological quality was considered high for modified Jadad quality scale scores of 4 to 7. RevMan 5.3 software was used to conduct a meta-analysis of high-quality studies. Results: Fifteen studies (578 participants) satisfied the eligibility criteria for this systematic review. Five trials (277 participants) assessed donepezil, four studies (124 participants) assessed memantine, three studies (72 participants) assessed bromocriptine, one trial (45 patients) evaluated galantamine, one study (21 patients) evaluated amphetamine, and one trial (39 patients) evaluated levodopa. The systematic review showed that donepezil achieved remarkable results in terms of the aphasia quotient (AQ) (SMD 0.82, 95% CI 0.48-1.17, P < 0.00001), repetition ability (SMD 0. 81, 95% CI 0.57-1.06, P < 0.00001), naming ability (SMD 0.56, 95% CI 0.29-0. 84, P < 0.00001), auditory comprehension (SMD 0.85, 95% CI 0.58-1. 13, P< 0.00001) and oral expression (SMD 0.90, 95% CI 0.54-1.26, P < 0.00001). Memantine showed no pronounced improvement in auditory comprehension (SMD 0.35, 95% CI -0.05-0.74, P = 0.09) but did improve the AQ (SMD 0.57, 95% CI 0.09-1.06, P = 0. 02), naming ability (SMD 0.81, 95% CI 0.38-1.25, P = 0.0002), spontaneous speech (SMD 0.76, 95% CI 0. 39- 1.13, P < 0.0001), and repetition ability (SMD 0.37, 95% CI 0.01-0.73, P = 0.04). Bromocriptine showed pronounced improvement in naming ability (SMD -0.20, 95% CI- 0.67-0.26, P = 0.39), verbal fluency (SMD 0.02, 95% CI 0.53-0.56, P = 0.95), and repetition ability (SMD 0.29, 95% CI -0.23-0. 81, P = 0.28). There is limited and inconclusive evidence for galantamine, amphetamine and levodopa. Conclusion: Current evidence suggests that drugs, such as donepezil and memantine, can improve the prognosis of PSA. Donepezil has a significant effect in improving the ability of auditory comprehension, naming, repetition and oral expression. Memantine has a significant effect in improving the ability of naming, spontaneous speech and repetition. Bromocriptine showed no significant improvements in the treatment of aphasia after stroke. Data regarding galantamine, amphetamine and levodopa in the treatment of aphasia after stroke are limited and inconclusive. Donepezil, memantine, bromocriptine, galantamine, amphetamine, levodopa, stroke, aphasia, meta-analysis.